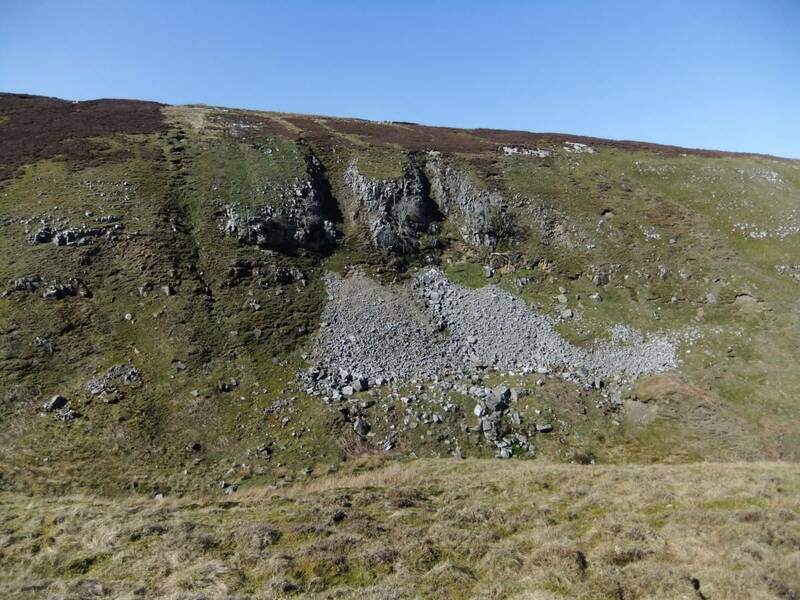 Geology Wind Egg is at 460m elevation and formed from The Main Limestone with overlying Richmond Chert and is the upper of three limestone scars or cliffs formed at different elevations on the eastern side of Willy's Gill Beck. Fairy Scar,the middle scar with the prominant the isolated slumped cliff stack being formed from The Underset Limestone. The lowest,Falls Scar is formed by the Middle Limestone. Record Name Walden Head. Willy's Gill. Wind Egg Scar. Depleted limestone ashwood at 460m. 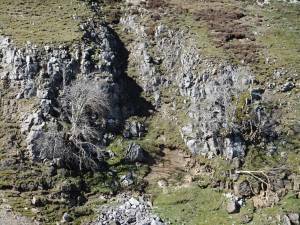 Record Description Relict depleted limestone ashwood community on small Scar or limestone cliff formed from the Main Limestone and overlying Richmond Chert strata. Common / Notable Species Rowan, Hawthorn only. See photos and above. Additional Notes This records the trees on Wind Egg which is the Uppermost Scar in Willy's Gill at 460m elevation, at the upper limit of trees in the North East Pennine Dales. Wind Egg supports just isolated trees of Rowan and Hawthorn. Lower down Willys Gill and in comparative shelter, the Middle and Lower Scars (see SWAAG Records to follow this)support a more varied limestone ashwood community with mature ash trees, a small cloned colony of about 12 aspens, a few downy birch, wych elms (all visibly dead, but probably springing from the roots, rowans, sallows, shrub willows, much vigorous bird cherry, rowan, hazel, hawthorn and blackthorn and downy rose. Recorded and photographed from the opposite bank of Willy's Gill Beck. 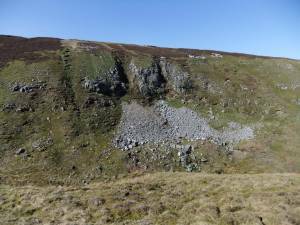 Notably absent are yews and juniper which would probably be present at similar elevation and localities in Swaledale. Image 1 Description Walden Head. Willy's Gill. Wind Egg Scar from west. Image 2 Description Walden Head. Wind Egg Scar. 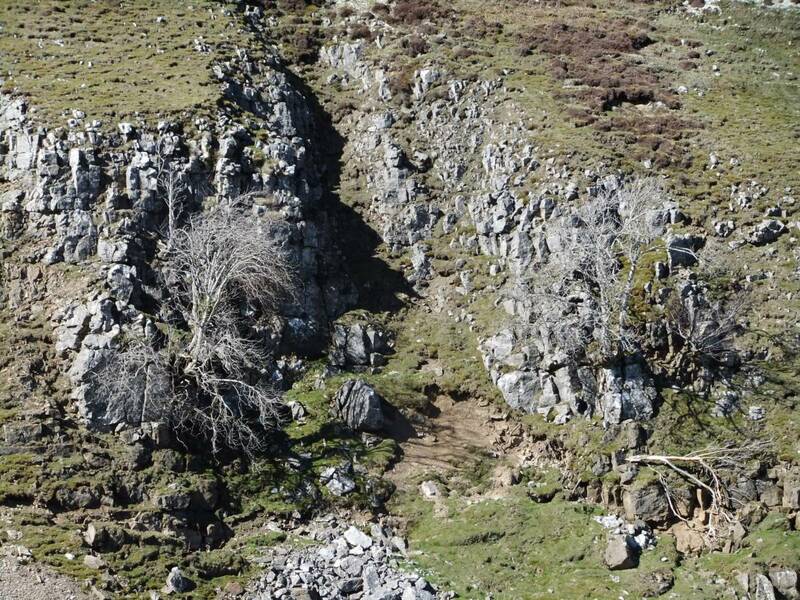 Limestone cliff accessible to sheep and with rowan and hawthorn only.